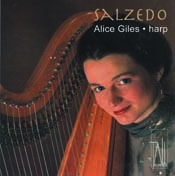 Alice Giles is one of Australia’s best musicians, and this CD contains some of Zalzedo’s seminal works for solo harp. Giles' beauty of tone and unabashed virtuosity bring a clarity and vigour to this music. “Carlos Salzedo (1885-1961) was a musician of all-round creative genius and great innovator. He was a virtuoso harpist and pianist, a renowned composer, teacher and conductor, and was a dynamic force in the contemporary music of his day. For the harp Salzedo has been the equivalent of Paganini for the violin or Liszt for the piano. His approach to the instrument brought it into the twentieth century in its rightful place as a powerful and colourful solo instrument, freeing it from the old concept of monotone sweetness. This recording was made in Germany in 1992 and re-released in Australia in 2008. It was recorded for Bavarian Radio. That Alice Giles should record and release an album of works by Carlos Salzedo (1885 - 1961) should come as no surprise. Giles was a pupil of Alice Chalifoux (1908 - 2008), principal harp at the Cleveland Orchestra from 1932 -1974 and Salzedo's most famous pupil (at the Curtis Institute) and protege. What is surprising, and refreshing, is the repertoire, which includes early works such as the Ballade Op. 28 (1910) on the first track, the final selection, Variations sur un theme dans Ie style ancien Op. 30 (1911) and the Suite of Eight Dances, from 1943, a much more "neo-classical" work than the material usually mentioned in connection with Salzedo. Salzedo numbered Varese, Ives, Stravinsky and Bartok amongst his musical peers and collaborators, so these pieces provide an excellent contextual framework in which to hear his other, more adventurous works. And herein lies the challenge of this set of recordings. We are presented with a sample of works by a composer for whom we often have preconceived ideas. Alice Giles has shown those ideas to be less valid than we thought, showcasing works which form a link between the harp writing of the late nineteenth century and the experimentalism of the twentieth. Yet she also reveals the composer (and perhaps, by extension, not just this one) as a far more complex being than the one we would like to keep in the music text books, safely categorised and under our control. Of course, there are good examples on this recording of what is to come: the fascination with tone colour for its own sake, the use of folk meters that do not easily divide into sub-groupings but must be heard as complete in themselves and the introduction of new techniques for expression and changes in tone colour. All of this is superbly performed. Alice Giles's virtuosity is completely in control of the material in this recording. The subtlety of her dynamic control and touch is breathtaking and her technical mastery is something that even a nonspecialist harpist such as myself can appreciate. It is difficult not to "gush": this recording is of a performer at the height of her expressive and technical powers, who understands the instrument and the music. She knows how to link the phrasing and tonal changes in these pieces, and her rhythmic sense is outstanding. Mention should be made of the recording quality here. The harp is a difficult instrument when it comes to microphone placement. The twin needs of the sound-board and the string are more complex than those of the piano, and there is danger of favouring either resonance or attack. This recording does great justice to Alice Giles's expressive capabilities. This is simply a superb recording and a must for anyone who wants to have a definitive collection of music that shows the birth of the modern method of playing, and thinking of, the harp, as well as a first-class recording of one of this country's finest musicians. Scintillation, for me the most familiar title of Salzedo's many works for harp, would be an apt description of Alice Giles's virtuosity. The speed and clarity, the impressive dynamic control particularly noteworthy in the delicate pianissimo passages-and attention to color and atmosphere, all combined in fluid, musically eloquent interpretations justify Luciano Berio's praise of her as "The most intelligent, sensitive, and technically accomplished harpist I have ever met." (He particularly admired her performance of his Sequenza II.) Thanks to her booklet notes, I've learned that Carlos Salzedo was not only a renowned teacher, composer, and technical innovator – he's considered the father of the modem school of harp-playing – but a pianist of great accomplishment, superb conductor, and tireless promoter of his creative contemporaries. She also points out the influence of his Basque heritage on his music, in which the number five figures frequently – Basque music is commonly performed in 5/8 – not only in meter, but in phrase lengths and even in the number of movements in suites or other collections. His music can be rhapsodic and impressionistic (the Ballade and Scintillation), didactic in the best sense (the Five Poetical Studies), in that it conceals technical objectives in musically ingratiating pieces, classically formal (the Variations, which revisit the French Baroque, reminding me at times of Georges Delerue's similarly tinted film scores), and ethnically charming, a la Granados, in the Dances (not all, however, are specifically Spanish). If you love the harp, this one's for you, but I'm convinced that this CD should have universal appeal, given the quality of Salzedo's compositions and Giles's marvelous playing. Recommended. Carlos Salzedo’s name is probably known to many, but I imagine that his music, apart from a couple of little pieces, isn’t. He was a virtuoso harpist, and made his Paris debut aged 18 on both harp and piano. Toscanini invited Salzedo to play at the Metropolitan Opera, in New York, and in 1909 he went to America without knowing a word of English. A few years later Salzedo, flautist Georges Barrère and cellist Paul Kéfer formed the Trio de Lutèce – it was for this group that Salzedo made his masterly arrangements of Debussy’s Children’s Corner Suite and Ravel’s Sonatine. He was involved in the new music circles in New York, and, with Edgard Varèse, who had emigrated to America in 1915, he co–founded the International Composers Guild which presented the works of the most prominent contemporary composers in concert. Salzedo was recognised as one of the greatest harpists and he was responsible for the creation of a repertoire for his instrument. His own music is well worthwhile and demands our attention (see reviews by Christopher Thomas: string quartets and Epifania). This recital by Alice Giles is a timely reminder of a fine composer and one who knew how to treat the harp as more than just a colouristic effect. Ballade is a relatively early piece and it’s straightforward in its language, Perhaps it’s slightly backward-looking; there’s an amount of Fauré here, not to mention a hint of Alphonse Hasselmans, Salzedo’s teacher at the Paris Conservatoire, who wrote a number of concert études of which La Source (The Wellspring), op.44 is still sometimes heard. Scintillation is just that – it scintillates. Written immediately after a trip to Mexico, the composer created a work which is, according to the notes in the booklet, “constructed on the basis of idealised dance patterns”. It’s a florid work, and one which is full of everything Salzedo knew the harp could do – almost a compendium of harp technique. It’s impossible not to relate to this vibrant music. The Poetical Studies are the work of an experienced composer, and whilst they don’t yet speak in the subtle language of Scintillation, they have much to say in an evolving vernacular. The first is a touch Debussyian – such as a more advanced Arabesque – the second mysterious and quiet, the third a kind of archaic dance. A beautiful nocturne, with lots of harmonics is placed fourth and the final movement is a return to impressionism and sustained harmonies. This is a lovely work, which takes its time gradually to tell you its story. The Suite of Eight Dances starts with a gavotte and minuet and ends with a tango and a rumba. This is a very pleasing lighter piece, necessary after the heavier works which have preceded it. To end, the wonderfully varied Variations sur un thème dans le style ancien, where each variation is a different kind of study. This is a most welcome issue, for we do not know anywhere near enough about Salzedo or his music. Alice Giles is a fine player and this is a very authoritative performance. What’s more, as it only duplicates two items – the Suite of Eight Dances and the Variations sur un thème dans le style ancien – with Sarah Schuster Ericsson’s Salzedo recital (Cambria CD 1151) one can have both disks and enjoy a variety of this fascinating composer’s music. Don’t miss him. CARLOS Salzedo (1885-1961) did for the harp what Paganini did for the violin, bringing it to the concert hall stage as a stand-alone instrument. A virtuoso harpist and pianist, he was also a composer and conductor and Alice Giles, who plays some of his finest works on a new Tall Poppies release, credits him with bringing it into the 20th century ‘‘in its rightful place as a powerful and colourful solo instrument’’. Salzedo was born in France to a family with strong Jewish and (like Ravel) Basque connections. These eclectic influences come out in the music and this selection, which was recorded for Bavarian Radio in 1990, features some of his best works. The CD opens with the lovely Ballade Op 28 but the pick of the tracks for me is Five poetical studies, which like Chopin’s etudes are ostensibly teaching exercises, but nevertheless are stand-alone works of art. Giles’s playing is luminous. Carlos Salzedo Works for solo harp is available at fine music shops or online. Thank you to Tall Poppies for packaging a leading female artist in a way that suggests good taste has not entirely gone the way of the pterodactyl. Yet. A model of informative clarity, the booklet gives Giles the opportunity to wax lyrical about French-born, Spanish-origin, subsequently US-resident Carlos Salzedo. He, and his music, have evidently been more familiar in specialist circles than to the general music-listening public. Giles has taken a particular shine to his notation, which has inspired her to conjure colours and moods from her harp strings that might have been plucked from the very head of Debussy while he was still wondering what they were. Technically an innovator, musically an improver, Salzedo made it possible to do things with the harp that most people could never have imagined, but it was strictly in the sense of the instrument's usual tonal potentiality. Salzedo was a committed romantic, with an innate sense of what sounded nice, whatever the likes of contemporaries Schoenberg and Webern may have had to say about such things elsewhere. This CD, recorded in 1992, covers a period from 1910 through to 1943. It might have been useful to hear the tracks presented chronologically, but the fact that they are not is an academic beef more than an artistic one. French-born American harp virtuoso, teacher, composer and prodigious organiser Carlos Salzedo was responsible for the recognition of the harp as a modern, serious instrument. This disc traces his development from impressionistic colouristics to restrained modernism. Ballade, from 1920, is reminiscent of the style of Ravel, while Variations on a Theme in the Ancient Style, from the following year, is a brilliant and confident catalogue of studies laying out the range of ways in which a harp can be played. More expressively subtle are the Five Poetical Studies from 1919, which mix impressionist sensibility with confident textural imagination. Scintillation demonstrates the collection of colouristic virtuoso effects Salzedo had developed by 1936, while the Suite of Eight Dances returns to the style of charming, slightly antique dance pieces popular in late 19th-century France. The Australian-born Giles, a harp player of international distinction, plays her instrument with refinement and effortless brilliance.